There are times when you just can’t take a camera bag with you, but you don’t want to leave your camera at home. I’ve heard all types of advice for carrying a camera in a non-padded camera case: “wrap it in a t-shirt” or “wrap it in a towel”…or worse…”just put it in the top of you backpack and hope for the best”. No. Thank. You. 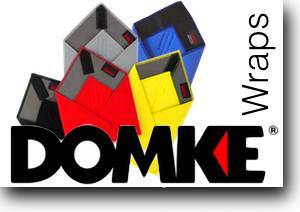 The nice folks at Domke have created a solution to this problem. Wraps. Square, padded, Velcro closing wraps that cradle your sensitive camera gear simply and safely when it’s inside your backpack, purse or suitcase. The come in a variety of sizes for different equipment and a variety of colors so you can know what’s inside without unwrapping your gear. At about 20 bucks each, this is an affordable and practical way to protect your gear in any kind of carrying situation.